all you have to do is book the bus, gather the kids and you’re off! Did you know that we at Switzer-Carty Transportation have Sothern Ontario covered? Any group, any trip – charter a bus with us! President’s Choice Cooking School is a great way to involve kids in the production of meals and desserts. Join a scheduled group class to take part in a group cooking activity that teaches teamwork, math and cooking skills for groups of all ages. Swing from the trees at this zip line adventure course at Heart Lake Conservation Area. A day trip to Treetop Trekking Brampton helps to develop skills in problem solving, communication, goal setting and physical fitness. Not to mention, it’s tons of fun! Get a lesson on environmental issues and initiatives in the Peel Region with a visit to Peel Region Public Works for one of many free tours and workshops. Learn about water and wastewater treatment, waste reduction and the importance of drinking water with one of their on-site tours or in-classroom workshops that are interesting for kids and adults alike. Amazon is such a common word in many households, and now you can see exactly what happens after you click ‘buy’! Take your kids group for a tour behind the scenes at Amazon’s Fulfillment Center in Brampton for an up close look at how Amazon works its magic. Get down and dirty at Downey’s Farm with a tour during their spring season. Take a wagon ride, visit farm animals and try your hand at strawberry plant growing in a 1.5- or 3-hour session with your group. As the weather warms, this is the perfect way to shake off the winter blahs and get the kids outside! The flight school at Brampton Flight Centre is the perfect group trip destination in Brampton. Learn the love of flying while incorporating math, science and geography lessons. With group tours, on-site lessons and even in-air flying experiences, your kids group will walk away with a new appreciation for air travel. The outdoor classroom at Elgin Woods Park offers free classes on topics related to wildflowers, trees, invasive species and pollinators, among other things. They also host guided nature walks that are a great way to get out and appreciate the world beyond our front door. Help your kids group explore their artistic side with a workshop, program or camp at the Peel Art Gallery Museum. 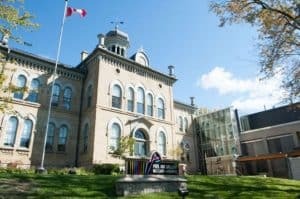 This combination art gallery and museum also offers kids a chance to learn about the history and heritage of the Peel region. Choose a drop-in weekend class, an on-site tour or a group workshop to experience the wonders of art and history.